Several months back, Ken wrote an article on bike gadgetry. Like many trendy, designer-types, when it comes to all things design, Ken is a fan of what I’d call, ‘intelligent or elegant simplicity’ – esthetics come second only to function. So, in an ongoing effort to keep his bike cockpit clear of cables, cords and compu-clutter, he posited on the application of the iPhone as a cycle computer. At the time, it was easy enough to see the possibilities, but the idea of attaching your precious iPhone to your headset as you hurl down some single-track didn’t seem very practical. Even a road ride would pose some risk – pavement isn’t known for its forgiveness. All that said, this hasn’t deterred a number of cycling apps from being designed. 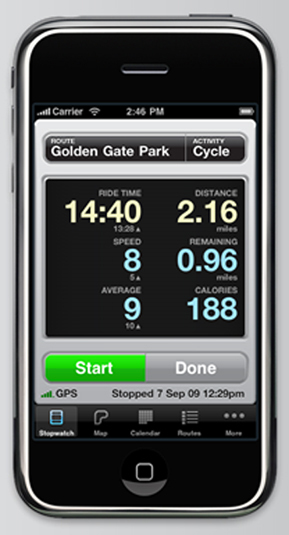 Abvio has developed iPhone apps for running, cycling, and walking. According to their site, they refer to their ‘Cyclemeter’ app as ‘iPhone centric’, meaning there are no web logins, no uploads or ads. GPS enabled, Cyclemeter will track: time, location, distance, elevation and pace for rides up to nine hours. You can also visualize your results via: maps, graphs and calendars. Additionally, you can also share your data thru Twitter. Sounds pretty slick, all in all. If you already own an iPhone, the Abvio Cyclemeter could be a perfect cyclo-computer solution, as long as you’re not also looking for ‘power/watts’ data. One limitation that I could see myself being bothered by, is that the interface is solely through your iPhone. Even in landscape view, reviewing your date could become tedious. An upload option might be nice. 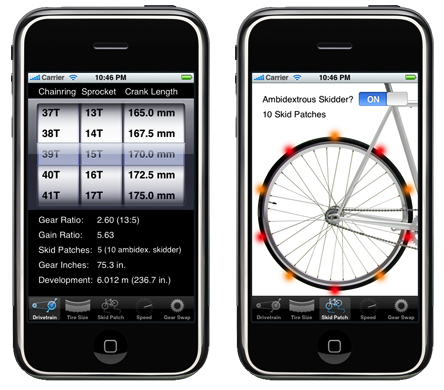 Another iPhone app that could be a lot of fun to play with is the Bike Gears’, Bicycle Gear Calculator. Offering over 200 preset tire sizes, the Bicycle Gear Calculator allows you to calculate a multitude of gear ratios, as well as a nifty skid patch analyzer for all you fixie riders out there looking to save ‘a little’ tire life. Wired put up a short article on the gang at Ubiquitous Entertainment, who, with the iPhone ‘A Rider’, have come up with a pretty clever way to allow a rider to keep their eyes on the road ahead of them, while still being able to read the iPhone GPS Google maps. By attaching a small screen to the side of the rider’s helmet, the rider can see both the road, and the screen at the same time. That said, I’m not sure the top of helmet placement of the iPhone itself would offer much in way of iPhone crash protection. Still, a super cool idea for bike commuters. Clearly, there are lots of cool apps out there now, and surely, many more to come. For now though, I still don’t think the iPhone posses the best cyclocomputer option, simply due to its fragility. Could a roadie safely use it? I think so, sure – at least for training rides, which is really when you’d want it most anyway. Clipping it to your handlebars in a Crit race, might not be your best idea. As for mountain bikers tough, I think we are still SOL. Apple isn’t about to start building iPhones rugged enough to handle what we’d put them through, but, someone could design a slick protective bar mount and case for it. If you find one, let me know. I’ve passed this info to my parents – they might want to use my mom’s iPhone while cycling in the River Valley! Thanks, guys! To be honest I haven’t investigated these apps too in depth, but the features that Steve talks about definitely make the Cyclemeter appeal to me. With that said, I’m still a fan of *one* device and I wouldn’t be surprised to see iPhone add ons that allow it to sync to ANT+ devices and pick up power and cadence data. Then we’d really be talkin! That A Rider just seems like a bad idea. The last thing you want while navigating through traffic and intersections and parked cars and pedestrians and who knows what else is a little screen providing constant opportunities to distract you, directly in front of one of your eyes. No thanks. I’m going to stick to the Edge 705. One device for the bike, one for me (a phone). 2 devices isn’t one too many. Plus, what if you keep getting phone calls while on the bike? That would be annoying, but mostly I would just be too paranoid about damaging it. A handy app that’s on my iPhone is SpokeMonkey. Simple yet effective. Has anyone tried LiveRider? The only thing I’m finding with all these apps is none of them can measure Heart rate. One more thing concerns me is what happens if it starts to rain? Your back pocket isn’t going to help protect your phone. But that said, I will try one of these apps like Cycle watch lite. It’s free! And, the ibikeconsole for 3G/3GS fits the iPhone 4 perfect! Check out the 4Lock iPhone mount. It is designed to protect the iPhone and locks it in place on all 4 sides. It is precision engineered just for the iPhone. Putting a quick heads up on our app too for anyone that finds it useful. Called Bike Doctor and it shows you how to repair your bike. It’s pretty useful even for anyone with a bit more experience with bike maintenance to refer back to. So far I have dropped my iPhone, talked outside while it was raining pretty hard, and been in windy conditions all to have my iPhone still pretty and looking as good as new, I imagine I could even duck tape it to my handlebars lol. I have never actually crashed on a bike with it (knock on wood) yet but I’m confident it would be in better condition then me afterwards. Now all we need is a bike mount for this bad boy! Does anyone know of a cycle app for the iphone where you can plug in the route. As you ride it provides directions via voice? Similar to the Car Navigation apps but records all the vital cycle data. Hey Santino – I haven’t run across any apps like that to date… Though I suppose that as long as you’re comfortable riding on the street, there’s no reason you couldn’t use a traditional car-based GPS. That way you could either mount it to your handlebars (like this) or have the phone in a jersey pocket or backpack with earphones. Thanks Ken, I download the GPS Drive Motion X app which seems pretty good. It allows me to avoid highways so it seems close to what I am looking for. Runkeeper is my tracker of choice…but I’m still seeking a decent mount that supports a small pair of speakers. This is a simple app that will speak speed, odometer, altitude, and time at user selectable intervals. Use your earphones and keep your phone in your pocket.